Will Anderson is a senior associate in the Dispute Resolution Department advising clients on a wide range of English law commercial disputes, including banking, IT, franchising, insolvency and general contract disputes. Splitting time between our Edinburgh and London offices, Will is an English qualified solicitor who concentrates on English law matters for clients from across the UK and further afield globally. 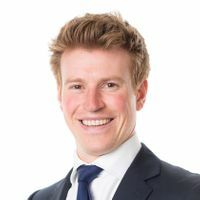 Will has successful experience of mediation to resolve complex disputes and when matters progress to court he has experience across the High Court, Court of Appeal and the County Courts. Will also has experience of seeking and defending injunction proceedings often against short timescales. Away from the office Will is a lover of the great outdoors and when time allows he will be playing tennis or golf, climbing at the bouldering gym or the climbing centre, summiting munros with his wife and small dog, running marathons and mountain races or enjoying the bracing north sea on (or more often off) his surfboard.